David Young was born and grew up in the Motor City just South of Detroit, Michigan. Gasoline runs through his veins starting in racing at the Drag Way in Milan, Michigan, David soon realized not only was this a weekend hobby but a life's passion. At the age of 19, David made his way back to San Diego, where he met a prominent Car Collector Chuck Swimmer of Charco Construction and The San Diego Collection. David was placed as an entry level shop hand the day the shop first opened. As his personal talents and abilities were recognized he quickly traveled up the chain. He acquired a broad experience and expertise in all aspects of a Classic Car Dealership. When the position of General Manager was vacated he became the logical choice. Within 2 years at the age of 21 he was Managing a Multi-Million dollar collection in charge of sales and acquisitions of some of the world's finest motor cars, including Pre-War Bugatti's, Bentley's, Rolls-Royce and Delayhaye. His other and varied responsibilities have included successfully organizing numerous special automotive events, gala parties, and charitable fundraisers. Participating in many of nation's most prestigious auto shows David with The San Diego Collection has shown and won multiple Concourse Including 9 showings and 3 wins at Pebble Beach Concours d'Elegance in Monterey, Ca , 7 showings and 4 wins at Amelia Island Concours in Amelia island, Florida, 3 showings a 1 win at the The Quail, A Motorsports Gathering in Monterey, CA, 7 showing and 7 wins at Meadowbrook Hall in Auburn Hills, MI, 6 showings and 6 wins at Keel and Wheels Concours d'Elegance of Seabrook, Texas, 2 showings and 2 wins at Texas Concours at Lake Torretta in Montgomery, Texas, 8 showings and 6 wins at the Pasadena Arts Center College of Design Car Classic. Tending to a variety of vehicles David and The San Diego Collection achieved success at over 150 Concours d'Elegance and Numerous Automotive events over the past 14 years. Not partial to only the Concours d'Elegance events, David has favored many small shows such as the Huntington Beach Cars and coffee events, Bob's Big Boy in Burbank car show, Local cruise nights, Car Club Cruises and Sunday meets. The most noted vehicles to have crossed his wake have been the sale and complete restoration of a 1929 Duesenberg belonging to Howard Hughes himself, the 1954 Desoto Adventurer II that sold at Barrett Jackson in 2012, a 1931 Bentley 8 Liter bodied by Murphy and the only 8 liter chassis constructed in the United States, at 24 years old his negotiation with the members of Bugatti trust resulted in the sale of a 1 of 3 1932 Type 50 Roadster that was Jean Bugatti's personal car, and the vehicle rightfully went back to the family. He supplied noted Collector John O'Quinn with several vehicles of which the 1938 Peugeot Darl'mat was the finest in his opinion, and arguably the best car John bought. Some of the most memorable times David recalls, was walking the grounds in the rain at Hershey Swap Meet, surviving flooding waters and torrential downpour while hunting for parts and cars. As everyone knows the mud and extreme conditions is all part of the Hershey experience. After purchasing a 1989 Jeep Grand Cherokee from the car coral and driving back to the lodge he tells a story “The road was washed out, and under 7-8 inches of water it was rushing across the pavement Chuck and I went for it only to be pushed off into the ditch, the rear tires slowly sank into the mud before locking in the 4 wheel drive and maneuvering the vehicle back to the main road, White knuckled and all”. This proves his nature of an all-around car guy, respected and befriended by all. It's his devotion to detail that serves him remarkably well, especially when bringing any selected car up to its maximum potential. As a result of David's lifetime's passion and love of the automobile “The San Diego Collection" grew and was formed by Chuck Swimmer to display his personal world class quality collection. 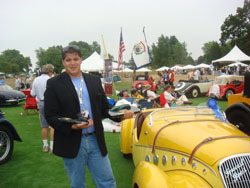 His extensive and unique collection, rapidly became recognized as one of the nation's premier vintage and classic car organizations under David's supervision. From 2001 to 2014 David acted as the top seat in this operation and after the untimely passing of the owner Chuck Swimmer, David took some well-deserved time off to console his thoughts and regained his vigor. Traveling the Old Route 66 from Arizona to Chicago, ILL David went home and gave himself a fresh sense of Americana Automotive History along the way. He recently found himself back on the west coast in the summer of 2014 and ready to enjoy the car hobby again. David contributes to the community and is an active participant in many organizations including Lifetime member 11-99 Foundation for the California Highway Patrol and top sponsor for the San Diego Police Historical Museum automotive events. Since his appointment as General Manager at Precious Metals Fine Motor Cars of San Diego David exhibits his strive for perfection and is consistently enhancing his education, knowledge and abilities. His skills are continually being challenged and sharpened by dealings and association with some of the most influential people in the car collector world. His plan is to bring Precious Metals to the highest level in the Vintage Automotive industry with the Sales and Acquisitions of the World's finest motor cars. Also offering a strict and detail oriented platform to restore and produce Award Winning Concours Show vehicles. In the words of David himself, "Our success is based on the satisfaction of YOU, the client. We will bring only the highest standard in service, advice and sales. Have no worries or concerns when dealing with our group. Your happiness is what will propel us to the next level." David's mission for future of Precious Metals is not only striving for excellence but continuing his slogan from The San Diego Collection “This a Car Place for Car People and Everyone is Welcome” as a revolving display of Exotic's, Classic's, Luxury and Muscle Cars, our doors are open to view some of the most unique and rare automobiles in San Diego. Our showroom not only is dedicated to the preservation of the automobile but we will host a variety of vehicles for purchase Including Ferrari, Lamborghini, Alfa Romero, Porsche, Mercedes and Jaguar. Our domestic offerings will be equally cared for and dedicated with proper marketing of Chevrolet Camaro and Chevelle, Ford Thunderbird, Mustang, Crown Victoria, Cadillac, and Chrysler products and others let us know how we may assist you. The emerging market of Foreign imports and Japanese specialty vehicles continues to grow in collector car market, each and every car will have a place to be considered by us for purchase or consignment and reside in good company with our current collection. Our Continuing goal at Precious Metals includes the consignment, acquisition, and sale of Rare and Desirable Vintage collectable cars, building a presence in the show circuit, attending local shows and National or International Concours d'Elegance . Dedicating our knowledge and abilities from our 70 years of combined experience to the client ensures their happiness with the marketing, sale and finalization of the transaction. For the well-deserved new client the excitement to deliver the car to its new home begins with the Key.